How to Analyze, Interpret and Read a Fine Art Painting. Painting is a visual art which means that the greatest paintings tend to be those with the greatest visual impact, while the most popular painting movements are typically those that are easiest on the eye. But this doesn't mean painting is trivial or superficial; on the contrary, many pictures can be extremely complex. Such complexity arises because of the artistic methods used to paint the picture (colorito), and/or its narrative content and message (disegno). Painterly techniques used can vary enormously. Jan Van Eyck was famous for his virtuoso oil painting technique to achieve his characteristic luminous finish; Mantegna and Tiepolo for their foreshortening; Leonardo for his sfumato; Michelangelo for his fresco painting technique, anatomical skill and male nudes; Titian, Veronese, Matisse and Jawlensky for their colourism; Caravaggio for his Tenebrism; Rembrandt for his chiaroscuro; Masaccio, Raphael and Canaletto for their linear perspective; Degas for his pastel drawings; Georges Seurat and Paul Signac for their Pointillism; Frank Auerbach for his impasto. These techniques, and many more besides, are all important elements which can be employed to increase the complexity and depth of a picture. So in order to appreciate a painting, one needs to analyze the presence of these elements and their effects. Colour has always been an important feature, and its use was often subject to certain rules. Egyptian painters, for example, used only six colours: red, green, blue, yellow, white and black. Red was the colour of power and authority. Green symbolized new life and fertility. Blue symbolized rebirth, while yellow symbolized the eternal, such as the qualities of the sun and gold. White symbolized purity, while Black was the colour of death. Male bodies were always painted in darker colours than female bodies. Understanding these colour rules is essential in order to read Egyptian paintings. Byzantine icon painters were subject to similar rules in their use of colour. Blue was reserved for human life, white for the resurrection and transfiguration of Christ. If you analyze icons of Christ and the Virgin Mary, you will notice that Jesus usually wears a red undergarment with a blue outer garment (God becoming a man), while Mary wears a blue undergarment with a red overgarment (she started as a human but is becoming closer to God). In the aftermath of the Renaissance, the emerging European art academies laid down rules which restricted the use of bright colours unless the context was appropriate. Several disputes errupted over this, with colourists like Rubens (and later, Delacroix) opposed to Poussin (and later Ingres). It was only with the advent of the French Impressionists and the Fauvists, that colour was freely used as an independent element. Of course the development of new colour pigments, from time to time, had a significant effect on the tonal range available to painters. So the colours on a Renaissance colour palette looked quite different from those on a 19th century palette. The narrative content of a picture embraces at least four basic types of content: (1) The main message. (2) Subsidiary messages. (3) Symbolism. (4) References and analogies. All these elements require interpretation and analysis before we can truly appreciate the painting concerned. The Garden of Earthly Delights (1500-05) by Hieronymus Bosch, one of the greatest Renaissance paintings, can serve as an illustration for these narrative elements. (1) The main message of the triptych is that humankind is naturally sinful, and needs to follow the word of God, to avoid hellfire and damnation. (2) Subsidiary messages include: (A) Left to their own devices, men and women succumb to the temptations of the flesh (illustrated by the entire central panel of the triptych). (B) Pleasure is as fragile as glass (illustrated by a pair of lovers in a glass bubble). (C) Gluttons, vain individuals and other Deadly Sinners will be punished in the hereafter (illustrated in the right-hand panel). (3) Bosch uses symbolism throughout the work. In the Garden of Eden (left-hand panel), the long-nosed figure reading a book is a symbol for Evil. In the Garden of Delights (centre panel) fruit, for instance, is a symbol of physical temptation, thus plucking fruit was a metaphor for seduction, while the peelings, which the lovers find so fascinating, symbolized worthlessness. (4) References abound. For example, in Hell, he paints a man whose hollow torso contains a sort of hellish tavern, frequented by resting 'devils'. Two enormous ears are pierced by an arrow and cut by the blade of a knife. The object symbolizes Man's deafness to the exhortation from the New Testament: "If any man have ears to listen, let him hear." Note: For more tips and advice about how to read a painting, see: Art Evaluation: How to Appreciate Art. Hieratic styles of painting, such as Byzantine art (c.500-1430) - notably its icons - Western Gothic art (c.1150-1375) and its ultimate expression International Gothic (c.1375-1450), were typically packed with narrative symbolism. However, as most of these styles involved Christian art, the symbolism used followed strict conventions, making it much easier to decode. Renaissance altarpiece art (1400-1600) was often a more difficult type of painting to interpret, as was the fantastical imagery of Netherlandish artists like Hieronymus Bosch and Pieter Bruegel the Elder. The High Renaissance, with public works by Leonardo da Vinci (1452-1519), Michelangelo (1475-1564) and Raphael (1483-1520), was arguably the zenith of such aesthetics. By comparison, Baroque painting was (on the whole) less complicated, focused as much of it was on conveying the message of the Catholic Counter Reformation, in order to overcome the appeal of Protestantism. The best Baroque paintings consisted of trompe l'oeil ceiling frescoes, and large-scale religious works. The big exception was Dutch Baroque art, notably the Realist School, whose still lifes were crammed with cryptic imagery. For biographies of professional critics, such as John Ruskin and others, see: Art Critics: Criticism of Visual Arts (1750-present). During the period (1600-90), the Protestant Dutch provinces of the Low Countries gave birth to a number of exceptional schools of Dutch Realism, including those at Amsterdam, Haarlem, Dordrecht, Leiden, Delft and Utrecht. This upsurge in 17th century Dutch painting was partly the result of the growth in commercial prosperity of the Flemish and Dutch ports, and the resulting emergence of a new type of Dutch art buyer - the materialistic merchant. At any rate, the Dutch Realism movement was responsible for some of the greatest genre paintings ever seen, as well as some of the most meticulous and complex still life paintings ever seen, many of which are extremely difficult to analyze and interpret. Examples include works by Dutch Realist artists as follows: Girl with the Red Hat (1665-6), The Artist's Studio (1665-6) and The Letter (1668), by Jan Vermeer; The Nightwatch (1642), Bathsheba (1654) and Syndics of the Cloth-Makers Guild (De Staalmeesters) (1662), by Rembrandt; Still Life with Chinese Porcelain Jar (1662) and Still-Life with a Nautilus Cup (1662) by Willem Kalf; A Table of Desserts (1640) and Festoon of Fruit and Flowers (c.1660) by Jan Davidsz de Heem; View down the Corridor (1662) by Samuel van Hoogstraten, and many others. It was during the final years of the Baroque era that religious art first experienced a significant decline, due to the reduction in the number of ecclesiastical patrons. In their place there grew up a new class of individual, often secular, patrons. Furthermore, these new art-buyers, who typically belonged to the newly emerging professional and middle classes, wanted a new type of art. Instead of large-scale works designed for large public buildings (churches, institutes etc. ), they wanted small-scale, portable easel-paintings to hang in their homes. In addition, with some exceptions, these middle class art-buyers were not interested in complex religious paintings, like (say) Leonardo's Last Supper (14951498), or other allegorical works such as Botticelli's Primavera (1478). Instead, they wanted portraits, landscapes or genre paintings which showed off their wealth, status and worldly power. In other words, a growing percentage of fine art from hereon (c.1700) was relatively materialistic (with fewer arcane references) and therefore easier to analyse and interpret. From the viewpoint of analysis and interpretation, paintings since 1700 are best divided into types (genres). The main types are: (1) History painting. (2) Portrait art - individual, group or self-portraits. (3) Genre Painting (pictures of every scenes). (4) Landscape painting. (5) Still Life. This category includes all 'narrative works', like mythological painting as well as historical and religious pictures. This is usually the most difficult type of picture to interpret, because it is designed to convey an inspirational or philosophical message. Since 1700 however, both its popularity and numbers have significantly declined. Examples include: Death of Marat (1793) by Jacques-Louis David, The Third of May 1808 by Francisco Goya, Orpheus (1865) by Gustave Moreau, The Morning of the Execution of the Streltsy (1881) by Vasily Surikov, Religious Procession in Kursk Gubernia (1883) by Ilya Repin, The Lady of Shalott (1888) by John William Waterhouse, The Yellow Christ (1889) by Paul Gauguin, and Guernica (1937) by Pablo Picasso. This category is less complex and relatively easy to analyse. For noblemen, gentlemen and the rich, during the approximate period c.1700-1900, a portrait served the function of today's photograph, except that the artist could manipulate the image to optimize looks, status and power. More recent portraiture has tended to be more expressionistic and thus more interesting to interpret. Modern examples include: Arrangement in Grey and Black: Portrait of the Artist's Mother (1871) by James Whistler, Portrait of Madame X (1883-4) by John Singer Sargent, Portrait of Isaac Levitan (1893) by Valentin Serov, Portrait of the Journalist Sylvia von Harden (1926) by Otto Dix, Portrait of Dora Maar (1942) by Pablo Picasso, Marilyn (1967) by Andy Warhol, Mr and Mrs Clark (1970) by David Hockney. [Note: The powerful portrait of Winston Churchill, painted by Graham Sutherland was adjudged unacceptable by the Churchill family and destroyed]. This category of painting tends to be the easiest to analyze when the artist is focusing on the social history of the scene. This type of genre painting would include works like: Derby Day (1856-8) by William Powell Frith, Man With A Hoe (1862) by Jean-Francois Millet, The Third Class Carriage (1864) by Honore Daumier, Barge-Haulers on the Volga (1870-3) by Ilya Repin, Paris Street, Rainy Day (1877) by Gustave Caillebotte, Luncheon of the Boating Party (1881) by Pierre Auguste Renoir, Cafe Terrasse by Night (1888) by Van Gogh, At the Moulin Rouge (1890) by Toulouse-Lautrec, A Country Brasserie, Brannenburg Bavaria (1894) by Max Liebermann, Coming from the Mill (1930) by L.S. Lowry. However, where the artist uses a genre-painting as a vehicle for a philosophical message, its interpretation can be more problematic. Many of Edward Hopper's urban genre-works fall into this category, notably Nighthawks (1942); another genre-painter whose paintings are difficult to read, is the Polish artist Balthus (Balthazar Klossowski de Rola). Other complex genre-pictures include: Les Demoiselles d'Avignon (1907) by Picasso, Berlin Street Scene (1913) by Ernst Ludwig Kirchner, Ennui (1914) by Walter Sickert, Pimp With Prostitutes (1922) by Otto Dix, American Gothic (1930) by Grant Wood, Christina's World (1948) by Andrew Wyeth, A Bigger Splash (1967) by David Hockney. For an explanation of some of the great modern genre paintings, please see: Analysis of Modern Paintings (1800-2000). From 1700 to 1800, the majority of landscape pictures commissioned were of the topographical variety, financed by landowners who wanted a pictorial record of their estate: a sort of portrait of the land (Mr and Mrs Andrews (1750) by Thomas Gainsborough). This type of landscape is often totally boring and requires no interpretation. During the later 18th century, the Romanticism movement triggered an upsurge of naturalism, as artists went out into the countryside to capture nature. This type of plein-air painting was made easier during the 1840s by the invention of the collapsible metal paint tube. Exponents of Impressionism like Claude Monet, Alfred Sisley, Camille Pissarro and others, fall into this category, as do the great 19th century Russian landscape painters like Ivan Shishkin and Isaac Levitan. Their paintings contain numerous painterly features which require analysis, but little independent 'meaning', so they tend to be easy to read. Lastly, landscape also includes scenic paintings with a philosophical message. These require more interpretation. Examples include: Hannibal and His Army Crossing the Alps (1812) by JMW Turner, Last of the Mohicans (series) (1826) by Thomas Cole, Man and Woman Gazing at the Moon (1830-5) by Caspar David Friedrich, The Great Day of His Wrath (1853) by John Martin, Island of the Dead (1880) by Arnold Bocklin, Road to Vladimirka (1892) by Isaac Levitan, Wheat Field with Crows (1890) by Van Gogh, and Nigredo (1984) by Anselm Kiefer. These pictures can look a bit too static for comfort, but many are heaving with symbolism, in keeping with the traditions established back in the 17th century. As a result, still life paintings can be exceptionally difficult to read. Outstanding modern still life painters include Paul Cezanne (Still Life with Plastic Cupid, 1895), Georges Braque (Still Life on a Table, 1914), and the Italian artist Giorgio Morandi (Still Life, 1960). The basic premise behind abstract art is that the formal qualities of a painting are just as important as its representational qualities. For example: a picture may contain a very bad drawing of a woman's head, but if (say) its colours are beautiful, we may nevertheless consider it to be a beautiful picture. This illustrates how a formal quality (colour) can override a representational one (drawing). Conversely, a photorealist portrait of the same woman may give an exact replication of her face but the hyperrealist colour scheme and general composition may make the picture lifeless and boring. (Compare for example the different approaches taken to portraiture by Lucian Freud and Alexei Von Jawlensky.) Thus abstract painting is all about form, and to interpret it we need to examine its formal qualities - including, shapes, colours, textures, and their mutual relationships. Are the shapes used naturalistic (Jean Arp, Joan Miro), geometric (Piet Mondrian) or monumental (Sean Scully)? What is the effect of the colours used? (Rothko, Barnett Newman) Has the artist paid special attention to the surface texture of the picture? How do all these elements fit together? And so on. As part of our Art Education series we are writing a number of mini-essays analyzing and interpreting some of the greatest pictures ever painted. See below for details. New paintings are added almost every day, so please bookmark this page to keep up to date. Maesta Altarpiece (1308-1311) Tempera/gold/wood, Siena Cathedral Museum. 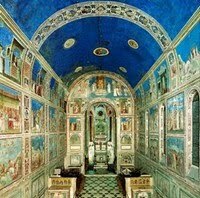 - Scrovegni Chapel Frescoes (c.1303-10) Cappella degli Scrovegni, Padua. Annunciation Triptych (1333) Uffizi, Florence. Allegory of Good and Bad Government (1338-9) Palazzo Pubblico, Siena. Dijon Altarpiece (1394-99) Museum of Fine Arts, Dijon. Holy Trinity Icon (c.1411) Tretyakov Gallery, Moscow. Merode Altarpiece (Annunciation Triptych) (c.1425) Oil/panel, Cloisters, NY. Ghent Altarpiece (1425-32) oil on wood, St Bavo Cathedral. Man in a Red Turban (1433) oil on wood, National Gallery, London. Arnolfini Portrait (1434) National Gallery, London. Battle of San Romano (1438-55) tempera on panel, National; Uffizi; Louvre. The Annunciation (c.1450) fresco, San Marco Museum. Descent From the Cross (Deposition) (c.1435-40) Oil on panel, Prado, Madrid. The Avignon Pieta (Pieta de Villeneuve-les-Avignon) (1454-6) Louvre, Paris. The Ecstasy of St. Francis (1480) Frick Collection, New York. Doge Leonardo Loredan (1502) National Gallery, London. Christ Crowned with Thorns (1470) Metropolitan Museum of Art, New York. Last Judgment Triptych (1471) oil/panel, Muzeum Narodowe, Gdansk. The Portinari Altarpiece (1476-9) oil/wood, Uffizi Gallery, Florence. Melun Diptych (1450-55) Oil/panel, Koninklijk Museum; Gemaldegalerie, SMPK. Garden of Earthly Delights (1500-05) Oil on wood, Prado Museum, Madrid. Virgin of the Rocks (1483-5) oil on panel, Louvre, Paris. Lady with an Ermine (Portrait of Cecilia Gallerani) (1490) Czartoryski Museum. Last Supper (149598) Tempera/oil, Santa Maria delle Grazie, Milan. Mona Lisa (1503-06) Oil on wood, Louvre, Paris. Isenheim Altarpiece (c.1515) Oil on panel, Unterlinden Museum, Colmar. Genesis Fresco (1508-12) Ceiling of Sistine Chapel, Rome. Last Judgment Fresco (1536-41) Altar Wall of Sistine Chapel, Rome. The Tempest (1508) Venice Academy Gallery. Sleeping Venus (1510) Gemaldegalerie Alte Meister, Dresden. The School of Athens (1509-11) Stanza della Segnatura, Vatican. The Sistine Madonna (1513-14) Gemaldegalerie Alte Meister, Dresden. Portrait of Baldassare Castiglione (1514-15) Musee du Louvre, Paris. Assumption of the Virgin (1516-18) S. Maria Gloriosa dei Frari. Venus of Urbino (1538) Uffizi Gallery, Florence. Jupiter and Io (1531-2) Kunsthistorisches Museum, Vienna. Assumption of the Virgin (Parma Cathedral) (1526-30). - Henry VIII (1536) Thyssen-Bornemisza Museum, Madrid. - Thomas Cromwell (1532-4) National Portrait Gallery, London. - The Ambassadors (1533) National Gallery, London. Madonna with the Long Neck (1535) Uffizi Gallery, Florence. Peasant Wedding Feast (1568) K.M., Vienna.  Disrobing of Christ (1577) Toledo Cathedral.  Burial of Count Orgaz (1586-88) Church of Santo Tome.  View of Toledo (1595-1600) Metropolitan Museum, New York. Conversion on the way to Damascus (1601) Cerasi Chapel. Supper at Emmaus (1601) National Gallery, London. Death of the Virgin (1601-6) Louvre, Paris. The Entombment of Christ (1601-3) Vatican Museums. - Samson and Delilah (1609-10) National Gallery, London. - Descent from the Cross (Rubens) (1614) Cathedral of our Lady, Antwerp. - Abduction of the Sabine Women (1634-5) Metropolitan Museum/Louvre. - Et in Arcadia Ego (1637) Louvre, Paris. The Surrender of Breda (Las Lanzas) (1634-5) Prado, Madrid. The Rokeby Venus (1647-51) National Gallery, London. Las Meninas (1656) Prado, Madrid. The Anatomy Lesson of Dr. Nicolaes Tulp (1632) Mauritshuis, The Hague. The Night Watch (1642) Rijksmuseum. Jan Six (1654) Private Collection, Amsterdam. Syndics of the Cloth-Makers Guild (The Staalmeesters) (1662) Rijksmuseum. The Milkmaid (c.1658-1660) Rijksmuseum, Amsterdam. Woman with a Pearl Necklace (c.1662-64) Staatliche Museum, Berlin. Girl with a Pearl Earring (Head of a Girl with a Turban) (1665) Mauritshuis. Girl with a Red Hat (c.1666-1667) National Gallery of Art, Washington DC. Pilgrimage to Cythera (1717) Louvre, Paris; Charlottenburg, Berlin. Oath of the Horatii (1785) Louvre, Paris. Death of Marat (1793) Musees Royaux des Beaux Arts, Brussels. The Valpincon Bather (1808) Louvre. La Grand Odalisque (1814) Louvre. La Grenouillere (1869) Metropolitan Museum, NYC. Impression, Sunrise (1873) Musee Marmottan-Monet, Paris. Gare Sainte-Lazare (1877) Musee d'Orsay, Paris. Water Lilies (Nymphéas) (1897-1926) Various art museums. Luncheon Of the Boating Party (1880-81) Phillips Collection, Washington DC. Bathers at Asnieres (1883-4) National Gallery, London. A Sunday Afternoon on the Island of La Grande Jatte (1884-6) Chicago. La Vie (Life) (1903) Cleveland Museum of Art. Les Demoiselles d'Avignon (1907) MOMA, New York. Guernica (1937) Reina Sofia Museum, Madrid. Weeping Woman (1937) Tate Modern, London. Nighthawks (1942) Art Institute of Chicago. American Gothic (1930) Art Institute of Chicago. Midnight Ride of Paul Revere (1931) Metropolitan Museum, NYC. For an explanation of his colour field pictures, see: Mark Rothko's paintings. For a list of the Top 50 Portraits, see: Greatest Portrait Paintings.  For more about how to appreciate paintings, see: Homepage.